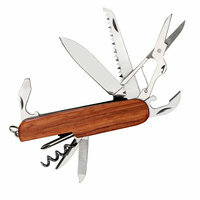 Similar to a Swiss Army Knife, this multi-purpose pocket knife has 9 tools including a saw blade, cork screw, 2 screw drivers, scissors, bottle opener, 1 knife blade and a file. The handles are solid?rosewood and the tools are stainless steel. The tool is 3 1/2" x 3/4" and 6 1/2" long when opened.